Born in 1953, lives and works in Krakow. Artur Tajber has exhibited his work since 1974. He has been involved in the performance art movement since the mid-1970s. In the late seventies he began organizational, curatorial and union activity as well as travelling abroad, mostly in France. In 1980 he returned to Poland and began his cooperation with the Regional Board of the NSZZ Solidarno－Małopolska. Member of the Company Committee (komitet zakładowy) of the Independent Self-Governing Trade Union of Artists and Designers “Solidarność” at the Regional Board of the ZPAP [Union of Polish Artists and Designers] in Krakow (the first one artistic board of Solidaność in the whole country). During martial law (announced by the communist regime 13th of December 1981) he was one of four founding members of the KONGER performance art formula (with Wladek Kazmierczak, Marian Figiel and Marcin Krzyzanowski) and became an assistant at the Department of Visual Arts of the Faculty of Industrial Design, Academy of Fine Arts in Krakow. Toward the end of the eighties he was involved in the reactivation of the ZPAP, founded and ran the gt gallery in Krakow; from 1989 he was a Vice-President of the Regional Board of the ZPAP and artistic manager of the Pryzmat Gallery. 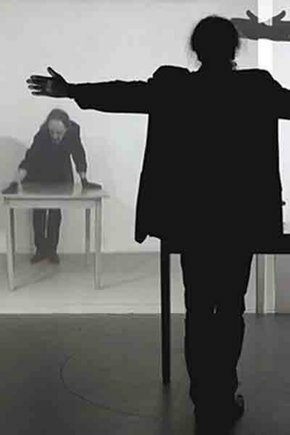 In the latter half of the 1980s he was elected president of the Fort Sztuki Association (Fortress of Art) and continued his artistic and curatorial activity in Poland, Norway, Canada, Ireland, Great Britain and many other countries in Europe, Asia and both Americas, where he also presented his own work, mainly in performance art. He is the co-author of a unique programme of education in intermedia (2001). In the second half of 2007 he was appointed head of the Department of Intermedia formed at the Faculty of Sculpture, Academy of Fine Arts in Krakow, where he also runs Poland’s first Performance Art Studio (BA, MA, PhD). Since 2007 he has also lectured on performance art at the Jagiellonian University and has worked at the Polish-Japanese Institute of Information Technology (PJWSTK). In 2012 he was the instigator of the Faculty of Intermedia and became its first Dean.